VICTORY -- THIS BILL IS "DEAD FOR THE YEAR"
On September 1, 2017, this bill, apparently for financial reasons, was "held under submission" (in other words, "shelved") by the Assembly Appropriations Committee. Read the September 12 LifeNews article, "California Assembly Rejects Pro-Abortion License Plates to Fund Planned Parenthood Abortion Biz." Earlier, on May 30, SB 309 creating pro-abortion license plates passed the 40-member California State Senate with 28 "aye" votes and 12 "no" votes (voting "aye" were all 27 Democrats and 1 "Republican," Anthony Cannella of Modesto). See SaveCalifornia.com's May 17 news release. SB 309 would have created a pro-abortion “specialty license plate” to generate more money to kill pre-born babies. This 2017 Action Alert has expired. ACT NOW: Tell your own California state assemblymember who represents the district where you live, “Oppose SB 309 -- don't make abortion a specialty license plate. This bill is profoundly unfair." WATCH: See how SaveCalifornia.com is representing YOUR pro-life values by speaking out against pro-abortion license plates. Watch the short Sacramento TV news story below that aired on KCRA news. Or click here to view. Opponents said the license plate is inappropriate for use, since pro-life plates have gotten nowhere in the state's Legislature. "They won’t allow people who say, 'Babies are human beings in the womb' to have a license plate. 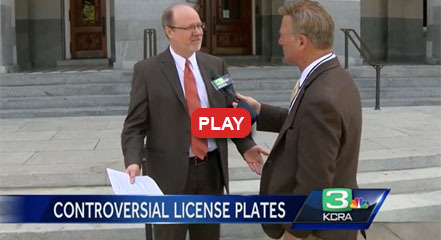 But now they want to say, 'Let’s do a license plate to raise money to kill preborn babies,' and this is categorically unfair," said Randy Thomasson, who serves as president of Save California. "The Democrats are pushing this bill. They’re supposed to be for the weak and vulnerable, right? But this bill specifically says, 'We want money so we can kill unborn babies.' That’s where the money would go, for abortion and abortion-related services."